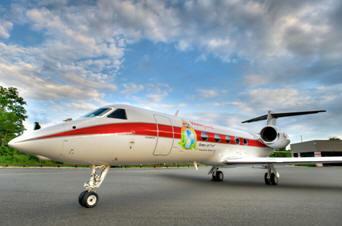 June 24, 2011 - A Gulfstream G450 recently became the first business jet to cross the Atlantic using biofuels. The Honeywell-operated aircraft flew from North America to Europe using a 50/50 blend of Honeywell Green Jet Fuel and petroleum-based jet fuel powering one of its Rolls-Royce Tay Mk 611-8C engines. The G450 was also the world’s first business jet to be powered by a biofuel. Gulfstream worked closely with Honeywell to ensure the viability of the company’s biofuel, which is derived from camelina, an inedible crop. The cooperative effort also supports Gulfstream’s commitment to achieving the business aviation industry’s goals on emissions reductions, including carbon neutral growth by 2020 and a reduction in total carbon emissions of 50 percent by 2050, relative to 2005 levels. Alternative fuels could account for 40 percent of these reductions, while the remaining improvements will come from technology and operations. “We are working with innovative companies, such as Honeywell, to ensure we can meet these initiatives,” Henne said. The G450 is an improved version of the GIV-SP/G400 using technologies from the G500/G550 (an upgrade to the GV). It has a "PlaneView" cockpit with 4 Honeywell 21 EFIS screens, and a Gulfstream-designed cursor control system. It also has the "Enhanced Vision System" (EVS), an infrared camera that displays an image of the view in front of the camera on a head up display. EVS permits the aircraft to land in lower-visibility instrument meteorological conditions than a non-EVS-equipped aircraft. The G350 is the short-range version of the G450. It has the same exterior appearance as G450, and includes the PlaneView cockpit, but does not have EVS as standard equipment, which is available as an option. Gulfstream and Honeywell share a long history of technological innovation. The G450 used in Saturday’s flight from Morristown, N.J., to Paris features a number of technologies the companies developed collaboratively, including the PlaneView flight deck, the Gulfstream Enhanced Vision System (EVS) and optional Synthetic Vision Primary Flight Display (SV-PFD). In 2001 Gulfstream began work on an improved version of the GIV-SP, originally designated GIV-X. It was later renamed G450. The G450 is lengthened 1 ft (0.305 m) over the G400 and shares the forward fuselage and larger cockpit of the G550. Production of the G450 began in October 2004, replacing the G400. The G450 has better performance and comes with the PlaneView cockpit with four 14 in (355 mm) liquid crystal displays and a Head up display (HUD). The shorter range G350 version of the G450 was developed and received certification in 2004.